Happy 2018. May your travels in the coming year be frequent and rewarding. Take advantage of the Park City Area Lodging Association's Delta Gift Card program, while supplies last. Book a minimum three-night stay at the Lodges at Deer Valley, Silver Baron Lodge, Goldener Hirsch Inn, Signature Collection, or Trail's End Lodge by Apr. 8, 2018, and receive a $300 Delta Air Lines electronic gift card. Choose from lodging packages including Early or Late Season Value packages and Ski Stay and Dine package. The offer is valid on new reservations only. Deer Valley Delta Gift Card program. Traveling around South Florida is about to get easier. Sometime in early 2018, Brightline, a privately owned train service will connect Miami to West Palm Beach in an hour, with a stop in Ft. Lauderdale in between. Phase Two expands to Orlando. Saving time is the biggest advantage as this corridor of South Florida is forever congested. When Orlando is added as a fourth stop, it will take three hours to reach from Miami, connecting two of the most visited cities in the U.S.
At the time of this writing, a ticket price has not been established. The company indicates the cost will be comparable to driving when factoring in gas and parking. The company plans on offering weekly, monthly and annual passes, plus Multi-Trip Packs. The cost will also depend on which class of service you select. Select coaches have leather seating with free parking, free food and beverages and free guest lounge access. Smart coaches are more competitively priced and will have more seating for families and small groups. Food and parking are optional perks you can add on. Seats will be offered as single or double, along with quad arrangements where double seats face each other with a table in between. Brightline stations are at NW 1st Avenue, between NW 3rd Street & NW 8th Street in Miami; NW 2nd Avenue, between W Broward Blvd and NW 4th Street in Fort Lauderdale station and the West Palm Beach station is at Evernia Street, between S. Rosemary Avenue and S. Quadrille Blvd. The Orlando station will be at the South Intermodal Center Facility at the Orlando International Airport. You will be able to buy tickets online, through an app, or at the station. The five Bright trains: blue, green, pink, orange, and red, are ADA compliant, with extra wide aisles. There’s a bathroom for every car (the dryer, door, and toilet are all hands-free); leather seats, room for bikes and pets, plus free WiFi and chargers at every seat. Visit Santa Barbara invites you to visit this winter with its “Revive & Thrive” promotion. Book two nights and receive a free third night or 20 percent off reservations at 17 participating Santa Barbara South Coast hotels. “Revive & Thrive” packages are available for three-night stays through Mar. 31, 2018. Participating hotels range from glamorous hideaways and oceanfront resorts to inns and boutique urban retreats. The “Revive & Thrive” lodging packages also include discounts and upgrades through “Miss Nothing” Experience Kits provided upon check-in. Kits include a Santa Barbara Field Guide with map and insider tips on what to do, see and eat; a wine opener; Santa Barbara letterpress coaster set and five “Miss Nothing” Experience Tokens. You can use the tokens to select two-for-one offers, discounts and upgrades from more than 20 participating Santa Barbara South Coast wineries, restaurants, retailers, tour providers and attractions. Among the token offers are two-for-one wine tastings, theater tickets, museum admissions, trolley tours, coastal cruises, and bike, kayak and stand-up paddle board rentals. Santa Barbara is 92 miles north of Los Angeles along California's Central Coast. Visitors can arrive via Highway 101, train, bus or by flying into Santa Barbara Municipal Airport (SBA) or Los Angeles International Airport (LAX). Santa Barbara Revive & Thrive or 800/676-1266. International SOS highlights the importance to manage your diabetes. Due to a range of factors inherent in travel, the ongoing medical management of mobile workers with chronic diseases such as diabetes may be disrupted. Failing to effectively manage chronic conditions can pose a greater risk to some travelling business executives than infectious diseases. The World Health Organisation (WHO) estimates that diabetes affects 8.5 percent of people over the age of 18 worldwide. Approximately 415 million adults have diabetes, and by 2040 this number is expected to reach 642 million. Dr Irene Lai, medical director at International SOS comments that travelers often focus on infectious diseases present in exotic locations. Infectious diseases are serious risks, a more common issue is the underlying chronic disease that travelers take with them, such as diabetes. Travelling across time zones, for instance, can complicate schedules for eating and taking medications. Foods are unfamiliar. Medications and supplies may be confiscated at borders. Losing or running out of medications while abroad may not be the simple problem it is when at home. Brand names are different, the medications may not have been stored properly, may have expired or may even be counterfeit. Visit your healthcare professional in advance of travel to discuss your itinerary and activities. Ensure your diabetes is stable and optimally controlled. Have enough medication for the trip and a bit extra in case of delays. Medication should be in its original container, clearly labelled with the contents and your name. Request a letter describing your condition, medication and equipment required and a carry a copy of your prescriptions. Maintain a healthy diet and active lifestyle even when away from home. VIA Metropolitan Transit offers visitors and locals its VIVA Passport Program, as a way to explore San Antonio with convenient and affordable bus service. VIA's VIVA service connects travelers with some of the most popular sites in Texas along three routes: VIVA culture (11), VIVA missions (40), and VIVA centro (301). The VIA VIVA Passport is a collectible booklet with offers from VIA partners with venues, storefronts, and events along all three VIVA corridors, providing information and guidance to plan a trip or a whole day of exploration. The VIVA Passports will be issued seasonally aboard VIVA buses, at partner locations, and at VIA's Customer Information Centers and Transit Centers. Select seasons in 2018 will be emphasized in the program, including San Antonio's Tricentennial, spring break/Fiesta, and the summer travel months. VIVA routes run daily. VIA serves 14 member cities and the unincorporated areas of Bexar County, operating seven days a week on 90 routes. VIA's VIVA service or 800/200-1213. As travelers want to find the best flight deals, CheapFlightsFinder has a service which displays the cheapest flights ever published from your local airport including super cheap airline error fares. The search engine works by unveiling the cheapest flight prices found from more than 1,200 sources then launching a search for those fares on a multitude of search engines - including Skyscanner, momondo, Dohop, KAYAK, and Google Flights. Not only are airline error fares uncovered but time sensitive travel deals officially published by the airlines. Once you have discovered an error fare, consumers can shave even more off the price by comparing those dates on different search engines, potentially saving up to 20 percent more. To find the fares go to CheapFlightsFinder.com, enter your local departure airport, for example - London, then select whole year - in flexible dates and hit search. Error fares occur due to many reasons, sometimes a misplaced decimal point, a currency conversion mistake or human error during data entry. The airline is under no obligation to honor these super cheap error fares but your chances are increased greatly if you follow these guidelines. Book directly through the airlines website. CheapFlightsFinder not only displays the error fare but also shows options of where to book. Book quickly before the airline figure out what's up. Error fares don't last long so book as soon as they are published. CheapFlightsFinder only publishes fares that were live in the last 15 days. Don't book other plans till your seat is secure. Sometimes the error fare is not honored. Don't worry, airlines must reimburse all out-of-pocket expenses made in confidence upon the reservation. If your travel plans are locked in or you are not flexible on when you fly CheapFlightsFinder has you covered. The site's dashboard also displays the cheapest departures from your chosen airport on your specified travel date. The Visit Philly Overnight Hotel Package returns for the winter with dining discounts and museum admission, plus free hotel parking. Bookable now, the winter edition runs through Mar. 4, 2018. Free parking: Forty-three participating hotels offer free parking for one car for up to two nights. Terracotta Warriors of the First Emperor – The Franklin Institute hosts this 2,000-year-old army of clay statues that guarded the tomb of Emperor Qin Shi Huang until they were discovered in 1974. You can exchange two free vouchers onsite for timed tickets. Audio tour included. Through Mar. 4, 2018. Blue Cross RiverRink Winterfest – Ice skating, cocoa sipping and lodge lounging at the Delaware River Waterfront. The winter package includes tickets for two rink admissions and two skate rentals. Through Mar. 4, 2018. Garces Restaurants: Garces offers a $25 gift card (alcohol, gratuity and tax included) to nine of restaurants. Special Exhibits: Daniel Tiger’s Neighborhood: A Grr-ific Exhibit, where the PBS Kids television series comes to life at the Please Touch Museum. With AmaWaterways’ Solo Traveler Promotion, guests traveling by themselves can reserve a spot on more than 145 departures in 2018, including 24 wine cruises. You can book the stateroom of your choice without paying a single supplement (all stateroom categories excluding suites, A+ and AA+) on cruises throughout Europe and Asia. In addition, the single supplement fee is waived with AmaWaterways’ Solo Traveler Program when booking a base category stateroom (category E and D) on any departure. Combinable with the Past Passenger Privilege and Onboard Future Cruise Benefit programs, both offers are capacity controlled. AmaWaterways offers a third option for solo travelers on four ships – AmaDolce, AmaDante, AmaLyra and AmaCello – which have a limited number of specially-designed single occupancy staterooms featuring a French balcony and require no single supplement. Solo travelers feel at home with an invitation to an exclusive Welcome Cocktail Reception, invite to dine at the Captain’s table in the main dining room and assistance in choosing from up to 20 free shore excursions offered each week. AmaWaterways’ Solo Traveler Program is not just for those traveling on their own. The program is also for people looking for more stateroom space on a girlfriend getaway or as part of a multigenerational family vacation. AmaWaterways offers river cruises with 20 ships that sail Europe’s Danube, Rhine, Moselle, Main, Rhone, Seine, Garonne, Dordogne, Dutch and Belgian Waterways and Douro rivers, Southeast Asia’s Mekong and Africa’s Chobe River. The company is known for stateroom design with “twin balconies”; a choice of included shore excursions with biking and hiking options. Each ship carries less than 162 guests and features free wine, beer and soft drinks with lunch and dinner, hair and massage salons and a fitness room and some ships with heated outdoor swimming pools and swim-up bars. Parks Canada places represent the best of Canada and tell the history, cultures and contributions of Indigenous Peoples. In 2018, admission for youth 17 and under is free for all national parks, historic sites and marine conservation areas. By making admission free for youth 17 and under, Canada celebrates families and the importance of protected areas. Youth will enjoy free admission, but Parks Canada returns to fee-based admission for adults and seniors to national parks, historic sites, and marine conservation area, including lockage at historic canals. The 2018 Parks Canada Discovery Pass is a way to discover nature and connect with Canada's history. For information on purchasing the 2018 Parks Canada Discovery Pass, visit the Parks Canada website. You can order a Parks Canada Discovery Passes online, at Parks Canada entry gates and visitor centers. For 2018, Parks Canada's admission fees for adults and seniors will not increase over 2016 prices. Parks Canada will offer free admission to new Canadian citizens for one-year through the Institute for Canadian Citizenship's Cultural Access Pass Program. Plan early and save 25 percent off the best available rate with the 21 advance purchase special at the Niccolo Hotel Chengdu in Sichuan, China. To take advantage of the offer, your booking must be purchased at least 21 days prior to arrival and the offer cannot be combined with any other offer. When you book, you must make a credit card prepayment for the full stay. Your prepayment will not be refunded for cancellations or date modifications. The advance purchase rate will not apply if you wish to extend your stay. That requires a new reservation for the additional date(s), subject to availability and prevailing rates. Additionally, the credit card used when you booked the offer must be presented during check in. If you change your stay dates, there may be an adjustment to the rate and your booking is subject to a service charge and VAT tax. There is also a 25 percent savings at the Niccolo Hotels sister Marco Polo hotel properties. Niccolo Hotel Chengdu Advance Purchase Rate. 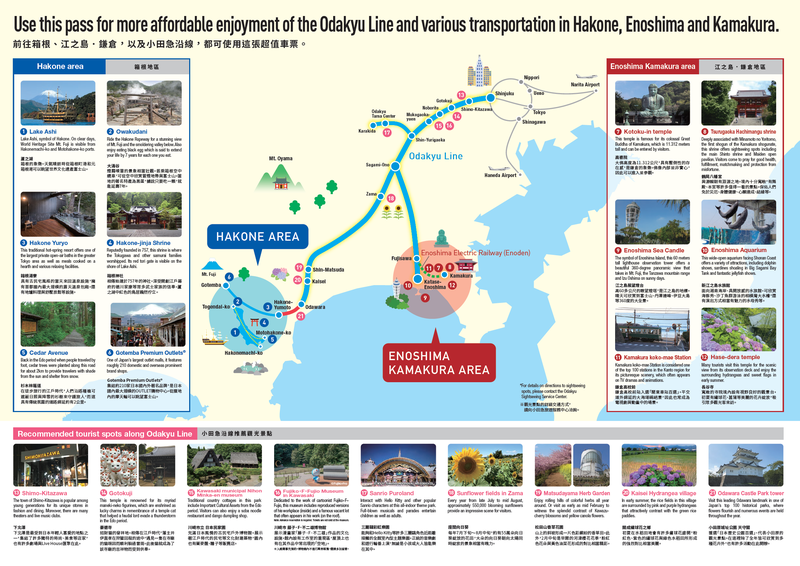 Odakyu Electric Railway Co., Ltd. sells the Hakone Kamakura Pass, a new discount excursion ticket for foreign visitors to Japan. It is an economical way for to travel from Shinjuku, Odakyu's terminal station in Tokyo and visit spots near Tokyo such as Hakone’s nature, hot springs, Mt. Fuji and Enoshima-Kamakura, a seaside destination. 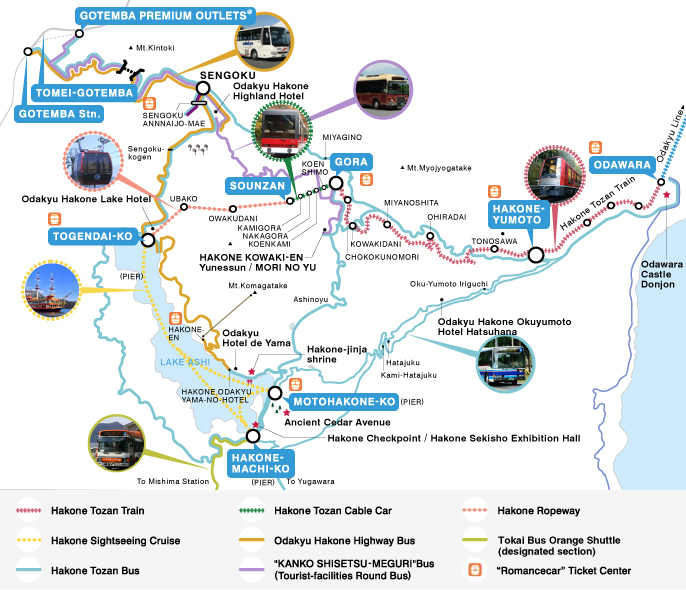 A single Hakone Kamakura Pass lets you ride and get off trains on all Odakyu lines linking Shinjuku with the Hakone area and the Enoshima-Kamakura area, and eight kinds of transportation in the Hakone area on the Enoshima Electric Railway Co., Ltd. (Enoden) lines. By showing the pass, you can receive free services at about 70 restaurants and art museums mostly in the Hakone area and the Enoshima-Kamakura area. The pass, valid for three days, is 6,500 yen for an adult. The Hakone Kamakura Pass is available at the ticket counter at Odakyu Sightseeing Service Center Shinjuku, near the west exit ticket gate at Odakyu Shinjuku Station. Valid for three days, the price is 6,500 yen per adult (about $60) and 2,250 yen per child between six and 11 years old. Trains between Shinjuku and the Hakone area and between Shinjuku and the Enoshima-Kamakura area: Trains on all Odakyu lines. A limited express ticket is needed to take Odakyu limited express "Romancecar. All Enoden lines in the Enoshima-Kamakura area. Holland America Line's View & Verandah promotion returns. Book select 2018 and 2019 cruises and Alaska Land+Sea Journeys and receive benefits to explore the world. Book an eligible cruise and receive a stateroom upgrade, onboard spending up to $500 per stateroom (depending on cruise length and stateroom category) and up to 10 percent off select shore excursions. Book a suite and receive prepaid room gratuities. The View & Verandah offers are available on cruises embarking Mar. 28, 2018, through Mar. 24, 2019, excluding Grand Voyages and Grand Voyage segments. As part of the View and Verandah offer, book an ocean-view stateroom for the price of an interior and a verandah for the price of an ocean-view. Depending on the length of cruise and category of stateroom, receive onboard spending money up to $400 per stateroom and $500 per suite. The onboard spending money is available to the first and second guests in a stateroom and can be used for specialty dining, spa services, gift shop purchases, and beverages. Reserve select EXC Tours shore excursions and get up to 10 percent savings if booked by Mar. 15, 2018. More than 1,500 EXC Tours are eligible for the savings. Suite guests receive prepaid room gratuities in addition to the onboard spending money and discount on EXC Tours. Cruise destinations in the View & Verandah sale include Alaska cruises and Land+Sea Journeys, Asia, Australia/New Zealand, Bermuda, Canada and New England, the Caribbean, the Panama Canal, Europe, Hawaii, Mexico and South America, and holiday sailings. Holland America Line or 877/724-5425. Save 10 percent with Trafalgar’s Early Payment Discount on new 2018 vacations when booked and paid in full by Jan. 11, 2018. Savings are per person based on double occupancy for the land portion only, vary by itinerary and are not valid on all vacations and departure dates. The discount is not valid with other promotional offers; but may be combined with most brochure discounts. The offer is for new bookings only and is subject to availability. Destinations include 2018 trips to the U.S.A., Canada and Central America; Europe and Britain, Asia, South America, Australia and New Zealand. Trafalgar Early Payment Discounts	or 866/513-1995. World Spree’s 10-night Middle Kingdom China tour is $1,399 per person based on double occupancy and subject to availability. The trip includes roundtrip airfare from Los Angeles or San Francisco (New York is $100 more); all intra-China transportation; accommodations in four-star hotels; 10 buffet breakfasts and two Chinese lunches; sightseeing tours with entrance fees; professional English-speaking guides; and baggage handling. The Middle Kingdom was ancient China’s name for itself, as rulers believed China was the center of the world. The journey starts in Beijing, where you climb the Great Wall of China and visit Tiananmen Square and the Forbidden City and stop at the “Bird’s Nest,” the main stadium for the 2008 Olympics. In historic Xian you’ll visit the terracotta warriors and horses and glimpse rural life in a typical village cave dwelling. In Shanghai, explore the city and shops on your own, or take an optional tour. Optional excursions include a trip to Hangzhou by bullet train with a cruise on the West Lake, a visit to the Dragon Well Tea Plantation for a Tea Ceremony, and a look at the Ming and Qing houses on Old Street. On the last day there’s an optional tour by motor coach to Suzhou, known for its canals and silk production, and to Tongli with its canals and bridges, cobbled lanes and Ming-style houses and shops. World Spree Travel or 866/652-5656. The best hotel rewards programs provide a wide range of free perks. Members receive amenities such as free Wi-Fi, late check out and bar credits. Most importantly, the top hotel rewards programs let you quickly earn free nights, redeem them with ease, and go about your business without worrying about fine-print restrictions. Every major hotel chain has its own loyalty rewards program which you can join for free. But hotel rewards programs are not equally rewarding. They have different rules, earning rates and point values, plus a variety of other perks. And much depends on where you travel, how often you stay in hotels, and how much you’re comfortable spending per night. WalletHub compared the 12 most popular hotel rewards programs using 21 key metrics, ranging from point values to booking blackout dates and did so for three different hotel budgets. For the third year in a row, Wyndham Rewards is the best hotel loyalty program for travelers of all spending levels, earning an average WalletHub Score of 72.30. Wyndham also won Redemption Options	with an average WalletHub score of 72.30. Drury Gold scored as high as Wyndham in Redemption Options, but Wyndham got the nod because it has far more locations. La Quinta won the Rewards Value category with an overall WalletHub score of 59.32. La Quinta offers up to $13.65 in rewards value per $100 spent – most among major hotel loyalty programs. Best Western won the Points that Won’t Expire category with an Overall WalletHub score of 65.12. Best Western is the only major hotel chain whose rewards points do not expire due to account inactivity. In some rewards programs, points expire as soon as 12 months of inactivity. Club Carlson won the category Fewest Earning Limitations with an Overall WalletHub Score of 59.80. Club Carlson has the fewest limitations because you get the same earning rate at all of its brands. Hilton won the Transfer Partners category with an Overall WalletHub Score of 56.24. Hilton Honors lets you pool points and allows you to transfer earnings to 49 travel partners, including American Airlines, Amtrak and United Airlines. The International Travel category goes to Marriott Rewards with an Overall WalletHub Score of 62.44. Marriott Rewards is the best for international travelers as Marriott operates properties in 126 countries. None of the hotel rewards programs allow members to earn points on reservations booked through third-party websites such as Kayak or Expedia. You can check the results from WalletHub’s hotel loyalty rewards comparison and crunch the numbers to find the best hotel rewards program for your needs using WalletHub’s custom calculator, which personalizes the results of this study based on your budget. Star Clippers offers sailing itineraries in the Eastern and Western Mediterranean between May and September. To help maximize your time abroad, the company offers free pre- and post-voyage stays at hotels in Athens, Cannes and Rome on select sailings. Athens: Book seven-day Northern and Southern Cyclades sailings aboard the Star Flyer, which departs roundtrip from Athens and receive two nights at the Electra Hotel Athens. The offer includes breakfast and transfer to or from the ship. The free hotel room is good on the Aug. 4, 18 and 25, 2018, departures. Prices start at $1,690 per person, based on double occupancy. Rome: On a seven-day sailing or a five-day trip from Cannes to Rome, extend your stay in Rome with one night at the Art Deco Hotel Mediterraneo. The offer includes breakfast and transfer to or from the ship. Good on the June 30 Cannes to Rome sailing on the Star Flyer, which starts at $1,270 per person, double occupancy; and the July 21 Sicily and Amalfi Coast sailing on the Royal Clipper, which starts at $1,845 per person, double occupancy. Cannes: Star Clippers offers five to seven-night itineraries from Cannes on the Royal Clipper and Star Flyer. Book a select sailing out of Cannes and receive two nights at the Radisson Blu 1835 Hotel. The offer includes breakfast and applies to the May 5 and 12, Sep. 22 and 29, and Oct. 6, 2018, departures aboard the Royal Clipper, which start at $1,845 per person, double occupancy; and June 2, 9, 16 and 30 departures on the Star Flyer, which start at $1,270 for five nights and $1,690 for seven nights, double occupancy. Liberty Travel offers a five night vacation at the Aston Waikiki Sunset in Honolulu from $979 per person based on double occupancy. The package includes roundtrip airfare from San Francisco, five nights’ accommodations, hotel transfers and a Lei greeting. The price from other cities includes: $1,265 from Washington D.C., $1,535 from Philadelphia and $1,439 from Chicago. The Aston Waikiki Sunset offers one and two bedroom suites with kitchenettes located two blocks from Waikiki Beach. You must book the offer by Feb. 14, 2018, for travel Mar. 5 through 10, 2018. Use Offer ID: 5787. If you’re planning a Salt Lake ski vacation, you have many dining and entertainment options after your day on the mountain. To make your stay in Ski City better, get a deal on a hotel and lift tickets. Treasure Mountain Inn in Park City, 800/344-2460 - has a fourth night free offer through Apr. 30, 2018. The offer is applied as 25 percent off stays of four nights or more and blackout dates apply. Their fifth night free spring offer is valid for travel Feb. 24 through Apr. 30, 2018, at select properties. Fifth night free is offered as 20 percent off stays of five nights or more with a one- time cleaning fee applied at check-in. Resorts West in Park City, 888/451-0156 - has a number of free nights specials, based on availability. Specials are valid until Apr. 8, 2018 and do not include home stays. Stay four nights in a select property and get the fifth night free. Use promo code PC5for4 online or Xplore Team when calling. Stay eight nights in a select property and get the ninth and tenth nights free. Use promo code PC510for8 online or mention Xplore Team when calling. Stay eleven nights in a select property and get the 12th, 13th, and 14th nights free. Use promo code PC14for11 online or Xplore Team when calling. Solitude Resort Lodging, in Solitude, 800/748-4754 - has an offer that when you book three nights of lodging and lift tickets, the fourth night of lodging and the fourth day of lift tickets are free. The package is available until Apr. 15, 2018, excluding Feb. 15 to 20, and Mar. 9 to 24, 2018. The packaged is based on availability and cannot be combined with other offers. During the holiday season when it seems North America lights up, who can resist seeing a glowing yellow 200 foot lighted dragon? You can still see enormous beast if you hurry. The Ohio Chinese Light Festival in Columbus, OH lasts until Jan. 7, 2018. If you don’t have time this year, make plans to see the Ohio Chinese Lantern Festival when it returns in mid-November 2018. 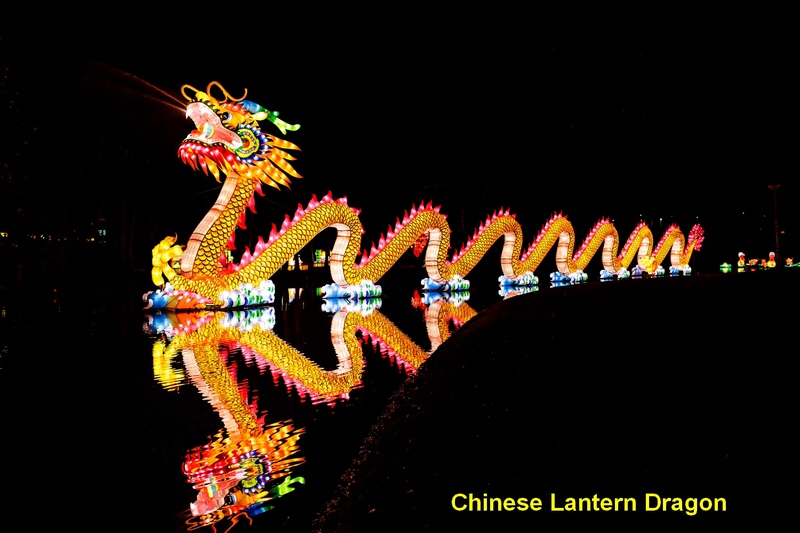 The Ohio State Chinese Lantern Festival, presented by Tianyu Arts and Culture, showcases Chinese art and culture through the exhibition of 34 Chinese lantern installations using traditional Chinese lantern methods and more than 27,000 LED lights in brilliant colors. This celebration features the works of artisans and entertainers from China. You stroll through a park outfitted with illuminating lantern sculptures of animals, flowers and nature and holiday figures. The signature, glowing yellow, Chinese Dragon lantern, which stands 200 feet long and 21 feet high, returns yearly, but all of the other lanterns are new and include color-changing dinosaurs and holiday-inspired installations. This year’s lanterns included colorful egrets, butterflies and owls looking impressive when contrasted against the dark night sky. The festival includes nightly live performances that are included in the admission price, Chinese artisan crafts and food and beverages. Each evening, the festival runs from 5:30 to 10 p.m. Nightly, the Festival’s troupe of acrobats and martial arts performers take to the indoor stage at 6:30 and 8 p.m. for a 45 minute show. The acts vary daily include: a Chinese face-changing dance, acrobatics, plate spinning and Mongolian and Tibetan-style dancing. Amazing acrobats perform remarkable contortions. The event is held rain or shine. Tickets are redeemable for any day of the festival and are available online. In 2017, a VIP ticket option included an audio guide, souvenir gift, guided tour at 6 p.m. and preferred seating at nightly shows. Premium gasoline offers some benefit to select vehicles, but the high cost may outweigh that advantage for many drivers, according to new AAA research. As a result, AAA recommends drivers weigh the potential benefits against the cost of using premium gasoline if their vehicle doesn’t require it. Nearly 1.5 million 2016 vehicles sold in the United States recommend, but do not require, the use of premium gasoline (91 octane or higher). In the past few years the gap between premium and regular-grade gasoline has risen from 10 percent to 25 percent, or about 50 cents per gallon. Past AAA research showed no benefit to using premium gasoline in a vehicle designed to operate on regular fuel. For this latest research, AAA partnered with the Automobile Club of Southern California’s Automotive Research Center to determine what, if any, benefit premium gasoline offers vehicles that recommend, but do not require, the use of premium gasoline. Fuel economy for test vehicles averaged a 2.7 percent improvement. Individual vehicle test result averages ranged from a decrease of 1 percent (2016 Audi A3) to an improvement of 7.1 percent (2016 Cadillac Escalade). Horsepower for test vehicles averaged an increase of 1.4 percent. Individual vehicle test results averages ranged from a decrease of 0.3 percent (2016 Jeep Renegade) to an improvement of 3.2 percent (2017 Ford Mustang). These modest fuel economy improvements during extreme driving scenarios do not offset the higher cost of premium gasoline. The trend toward recommending or requiring higher-octane fuel continues to rise as manufacturers work toward meeting stringent CAFÉ (Corporate Average Fuel Economy) standards. Follow the vehicle owner’s manual to determine which type of gasoline to use. Always use premium gasoline on vehicles that require it. Drivers of vehicles that recommend, but do not require, premium gasoline should consider their driving habits, and the potential benefits and costs associated with using higher-octane fuel. If your engine makes a “pinging” or “knocking” sound when using regular fuel in a vehicle that recommends premium gasoline, a higher-octane fuel may resolve the issue, but it’s a good idea to have the vehicle checked by a reputable repair shop. Drivers who choose to use premium fuel should shop around for the best price. Drivers looking for a higher quality fuel can select a TOP TIER gasoline. Previous AAA research found that gasoline meeting TOP TIER standards resulted in fewer engine deposits than non-TOP TIER fuel. TOP TIER gasoline is available in all octane levels. Learn more at TOP TIER gas. NATURE'S MIRACLE PRODUCT -- in today's computerized world, we're still using a product discovered by chance more than 10,000 years ago -- VINEGAR!! Throw out toxic cleaners and insecticides that pollute! Save money and save the environment by using vinegar, one of the worlds safest all-natural products. Get more than 150 powerful recipes using vinegar for cooking, health care, gardening, pet care and household uses for only $4. To order, send an email to: travelnewsletter@aim.com with Order Vinegar Care in subject line. The Travel Savings Alerts Newsletter, P.O. Box 91033, Columbus OH 43209, edited by Nicki Chodnoff, is published monthly.